An ancient rock shelter in remote Arnhem Land decorated with complex x-ray figures and naturalistic animals is one of a number of extraordinary Indigenous sites featured in this exhibition of work by acclaimed Melbourne photographer John Gollings. 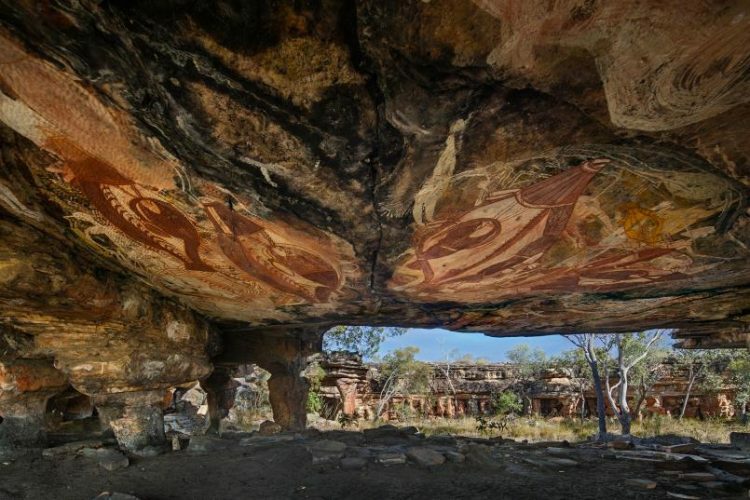 Nawarla Gabarnmang, a cathedral-like structure with rock pillars supporting a vast roof, was excavated and painted by its Aboriginal inhabitants between 23,000 and 35,000 years ago. Gollings’ breathtaking photographs of the recently discovered site continue his ongoing fascination with the historic art and architecture of First Nations peoples around the world.